I recently returned from the USA where I represented Insight during the St Patrick's Day celebrations over there. A particular highlight was the announcement of a new Science Foundation Ireland cross-Atlantic collaboration with the U.S. National Science Foundation (NSF) Innovation Corps (I-Corps™) programme, that will see 20 Irish-based researchers benefit from entrepreneurial training in America. The announcement, made by an Taoiseach Enda Kenny, marks Science Foundation Ireland becoming the first European Funding Agency to implement the highly regarded NSF entrepreneurship programme. Insight has two teams participating in the programme, led by Prof Mark Keane and Dr Cathal Gurrin. It was a great honour to be there. 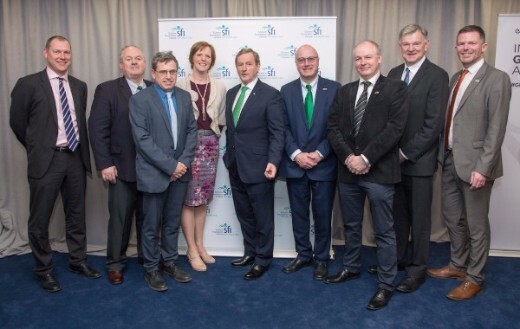 The picture from the event is at the head of this newsletter and features Dr Christian Stafford of the INFANT Centre, myself, Prof Mick Morris of the AMBER Centre, Dr Sally Cudmore of APC, An Taoiseach, Enda Kenny TD, Prof Mark Ferguson, Director General of Science Foundation Ireland, Prof Vinny Wade of the ADAPT Centre, Prof Kieran Hodnett of the SSPC Centre and Dr Frank Smyth of the CONNECT Centre. As you will see from the news below, there is a huge amount of work going in the centre. In April we will be launching our strategy which will tell the story of Insight's next steps. For now, suffice to say that Insight's research is shaping itself under four themes that we believe will allow us to live up to our vision: Empowering Citizens. Smarter Societies. These themes are: eHealth and Human Performance, Sustainability and Natural Resources, Smart Communities and Networks and Smart Enterprises. 2017 is shaping up to be an exciting year. Professor Barry Smyth won the ACM Intelligent User Interfaces inaugural ‘Most Influential Paper Award’. Rob Argent won first prize for his video entry as part of his work in the CHESS EU funded project at the first virtual CHESS Plenary session. Insight held the first Augmented Human showcase in Ireland on Thursday March 23rd last. The event, held in Croke Park, provided a glimpse into the future of wearable technology, human machine interaction and artificial intelligence. CEO Oliver Daniels, Prof Barry Smyth, Prof Brian Caulfield and Prof Alan Smeaton all spoke to the attendees. Then those gathered got to explore the wide range of research demonstrator projects that gave a glimpse of the breadth of Augmented Human research going on in Insight. In January, Prof Alan Smeaton was awarded the highest possible honour by the world’s leading professional association for advancing technology for humanity for his outstanding contributions to multimedia indexing and retrieval. The Institute of Electrical and Electronics Engineers (IEEE) has awarded Prof Smeaton a fellowship, the highest grade of membership which is conferred upon a person with an outstanding record of accomplishment in any of the IEEE fields of interest. 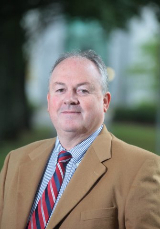 Professor Smeaton joins only fourteen IEEE Fellows in Ireland to date. You can read more about it here. Insight researcher Andrew Parnell had two significant publications about rising sea levels this month. Regional and global sea-surface temperatures during the last interglaciation was published this week in Science Magazine, while Relative sea-level trends in New York City during the past 1500 years was published in the Holocene. The research has drawn a massive amount of attention from both inside and outside the science community. Major media outlets internationally such as the Independent, Guardian, Scientific American, Times of India, Los Angeles Times and Radio France have covered the research findings. You can read more about it and see links here. In February, Insight signed a Memorandum of Understanding (MoU) with the largest data science centre in the Netherlands. The five year agreement is designed to develop a greater understanding between the two institutions and to cooperate in academic areas including staff exchange, student exchange, joint research and training. This collaboration with Amsterdam Data Science is part of Insight’s continuing programme of outreach to the largest data centres across Europe. ​(Pictured: Insight Business Development Manager Eamon O'Doherty and Director of Amsterdam Data Science Professor Maarten de Rijke) Read more about it here. Insight’s Nasim Mahmud was recently interviewed on BBC Bangla Radio regarding the use of Machine Learning to handle fake news on Facebook. The interview was part of a report on the recent US election. You can listen to the interview here. In January, Insight's partnership with InsideSales.com was announced. The announcement generated a huge amount of interest worldwide. The technology company signed a new partnership with Insight, and also announced a new growth equity round of investment that included the participation of the Ireland Strategic Investment Fund. It has also closed a successful $50m funding round, and has immediate plans to open an Irish office and fill up to 120 jobs. You can read The Irish Times piece about the announcement here. Fujitsu, Insight Centre for Data Analytics and Systems Biology Ireland partner to develop an automated engine for predicting phosphorylation reactions, important building blocks of cellular signalling networks that can be used for developing new cancer therapies. Read more about it here. A new era in transport and logistics is dawning on Europe. Insight@NUI Galway researchers are part of the EU funded Big Data Value Lighthouse project TransformingTransport, which will show concrete, measurable and verifiable evidence of data value that can be achieved in mobility and logistics. Insight's Alokkumar Jha, Yasar Khan, Dietrich Rebholz-Schumann and Ratnesh Sahay's research has been published in the Journal of Cancer Research. This is a major achievement, the Journal of Cancer Research has a huge impact factor of 9.39. The research entitled, A linked data approach to discover HPV oncoprotiens and RB1 induced mutation associations for the retinoblastoma research, is part of the BIOOPENER project that uses advanced linked data and analytics techniques over the large scale cancer genomics datasets (TGCA, COSMIC, ICGC, etc). Brendan Smith, Insight's EPE manager based in NUI Galway wrote in the Galway Advertiser about his experience of running coding workshops for people living in refugee camps all over the world. You can read the full article here. Running, skipping, kicking a ball, catching a ball – these are movements that come naturally to all children. At least that’s what we assume. But recent research coming out of Dublin City University found that just 11% of Irish adolescents had mastered basic skills such as these, known as Fundamental Movement Skills (FMS). Now Insight is spearheading the largest study ever conducted into the FMS crisis and a potential solution – the Moving Well – Being Well project which was launched in Croke Park on the 23rd of March. Read about it here. Insight's Girls Hack Ireland held yet another successful hackathon for teenage girls. On the 11th of March, students from all over Ireland descended on All Hallows College DCU for a website making workshop. Insight's own researchers including Dr Aoife Morrin and Dr Suzanne Little gave presentations and encouraged the students throughout the day. Well done all! Insight Funded Investigator, Dr Aoife Morrin's research featured on the cover of the journal Electroanalysis. The article was about a smart wearable tattoo that assesses skin quality and monitors disease. Electroanalysis is an international, peer-reviewed journal covering all branches of electroanalytical chemistry, including both fundamental and application papers as well as reviews dealing with new electrochemical sensors and biosensors, nanobioelectronics devices, analytical voltammetry, potentiometry, new electrochemical detection schemes based on novel nanomaterials, fuel cells and biofuel cells, and important practical applications. Dr Morrin is based in Insight@DCU. A novel DCU research project that helps people living with dementia was the subject of a report by Evelyn O'Rourke on RTE's Today with Seán O'Rourke in January. Prof Alan Smeaton was interviewed about the project in which people with dementia can drive a virtual bus that brings them through familiar areas of Dublin. The project has been a big success on a local leve and Smeaton's team has been helping to advance the project. You can listen to the segment here. Insight's Prof Dermot Diamond was interviewed on 9 News Illawarra in Australia about his research collaboration with Wollongong University's Prof Gordon Wallace which led to the Sweatch, a wearable watch-like device that is able to read the molecular composition of sweat. You can watch the news item here. Copyright © 2017 Insight, All rights reserved.